Satisfy your appetite at Main Theme, one of the property's 3 restaurants. Relax with a refreshing drink at one of the 2 bars/lounges. A complimentary buffet breakfast is included. Featured amenities include a 24-hour front desk, luggage storage, and a library. Free self parking is available onsite. When you stay at Village Panorama - All Inclusive in Malevizi, you'll be near the beach and 11 minutes by car from Psaromoura Beach. This all-inclusive property is 14.9 mi (24 km) from Heraklion Port and 13.2 mi (21.2 km) from Heraklion Archaeological Museum. Make yourself at home in one of the 209 air-conditioned rooms featuring refrigerators and LCD televisions. Rooms have private furnished balconies or patios. Satellite television is provided for your entertainment. Conveniences include phones, as well as blackout drapes/curtains and in-room child care (surcharge). Enjoy a range of recreational amenities, including a spa tub, a fitness center, and a seasonal outdoor pool. Additional features at this Mediterranean hotel include complimentary wireless Internet access, wedding services, and a television in a common area. Getting to nearby attractions is a breeze with the area shuttle (surcharge). You can enjoy a meal at Red Pepper serving the guests of Out of the Blue Capsis Elite Resort, or stop in at the snack bar/deli. Grab a bite from the snack bar/deli serving guests of Aquarius Apartments. Continental breakfasts are available daily from 8:00 AM to 10:30 AM for a fee. Renia Hotel Apartments is situated in the center of the village of Agia Pelagia. The sandy beach is just 2 minutes walk away, as well the shops and the restaurants. An off site car parking is available at the hotel. Guests can enjoy a breakfast buffet at the hotel restaurant. Room Facilities Renia Hotel Apartments. All rooms have a hairdryer, tv, air-condition, kitchenette and balcony. Smoking is not allowed in the rooms, but it is allowed on the balcony, as well as in public areas of the hotel. Wifi internet access is available free of charge. Tea and coffee making facilities are available in every room, which also feature a refrigerator. Leisure Info. Leisure facilities are available at the Renia Hotel Apartments. The hotel has an outdoor swimming pool. Adventurous guests can choose from activities including mountain biking with our mountain bike hire, fishing, horse riding and sailing. Other Info. The hotel offers an airport shuttle service. Pets are not allowed in the hotel. Hotel guests can make use of the concierge service that is provided. The reception is open from 8:00 till 23:30. Please specify the time of your arrival. Guests can rent a car with a very low price at the reception. Or order by mail or telephone. Excursions also are available to book at the reception. Please contact us for your requests. This apartment hotel is set just 150 metres away from the beach, in Agia Pelagia. The property is located at the heart of Crete, offering the ideal base from which to explore this mesmerising island. A number of taverns, bars and cafes can be found nearby. The property boasts a stunning mountain backdrop, enjoying spectacular views over the sea. 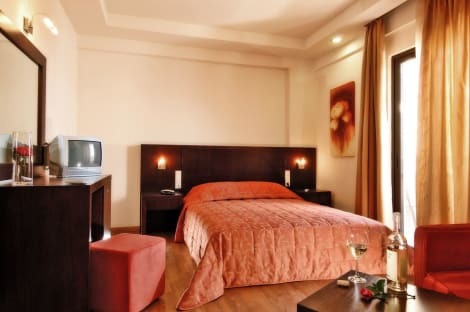 This hotel offers visitors the utmost in comfort and convenience, complemented by traditional style. The guest rooms are superbly designed, enjoying simplistic style and modern conveniences. Guests can relax and unwind on the spacious roof garden, admiring magnificent views over the Aegean Sea. lastminute.com has a fantastic range of hotels in Agia Pelagia, with everything from cheap hotels to luxurious five star accommodation available. We like to live up to our last minute name so remember you can book any one of our excellent Agia Pelagia hotels up until midnight and stay the same night.